Steemit is a platform that combines blockchain technology, social media, and cryptocurrency for the creation of user-generated content and community building. The social community helps to produce content and curate it, while it gets rewarded with two main cryptocurrencies: 50% in Steem Power and 50% in Steem Dollars. As we will see throughout the guide, Steemit uses financial tools similar to those used by startups. With the main difference, those rely on the blockchain technology and cryptocurrency, rather than on a few venture capital investments and equity ownership. A little caveat: I’ll use the term Steemit and Steem to mean the same thing. What does the Steem community do? How successful is the Steem cryptocurrency? How does the Steem work? How does Steemit Payout work? The company was co-founded by Ned Scott, CEO, and Daniel Larimer, CTO in January 2016. When the idea of Steem and Steemit really began to form we had been exploring several different blockchain-based business models. We were looking at micro insurance on the blockchain and a few other ideas, but ultimately, we kept coming back to the idea that the most useful and powerful thing to leverage around a cryptocurrency is a community. Steem was born out of ideas about insurance and mutual aid: it was the idea that people would be able to help each other peer-to-peer if they were struggling to solve problems or needed assistance. It quickly grew into a much larger vision and Steemit was born as a place where individuals get rewarded by a community for posting and voting on content. That was back in January of this year. We were in May 2016. In April 2016 Steemit had launched an alpha testing, helped by more than 150 early adopters. As specified by Ned Scott in the same interview, the uniqueness of Steemit stands on the fact that everything that is done on the platform (posts, comments and voted) sit directly on the blockchain. Why is this important? This not only allows to manage things with a distributed system, where there is no central authority. It also should put an end to the old paradigm that took over the web in the last two decades, of a few tech giants that take over the world thanks to the data users give away for free. 2. A means to get high-quality answers to personalized questions. Where companies like Facebook have been able to create huge wealth for its shareholders. Their business model is also mainly based on advertising. In fact, companies like Facebook, Twitter, and Google use a hidden revenue business model, which gives free services in exchange for users’ data. In this panorama, users seem to be the winner as they get incredible services for free. However, this isn’t always the case. Users might get something for free, but they’re giving up something way more valuable: their data. In fact, Companies like Facebook and Google as of 2017 make dozens of billion dollars in profits without sharing any of those with its users. 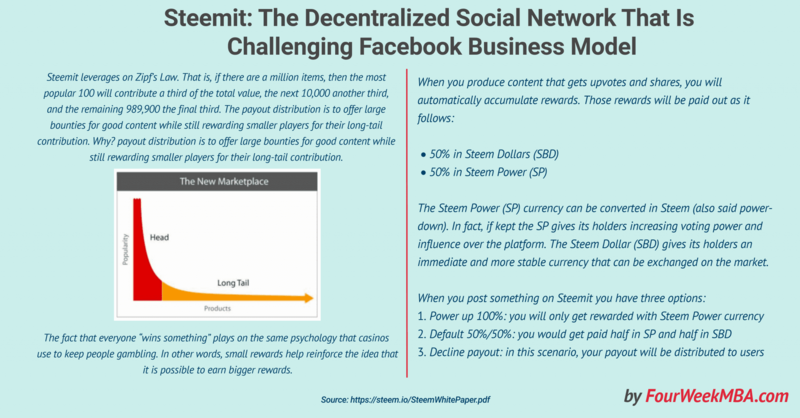 Instead, the Steem community starts from the assumption that with the incentives created by cryptocurrencies it is possible to bootstrap a social media platform like Steemit. The vast majority of people have more free time than they do spare cash. Imagine the goal of bootstrapping a currency in a poor community with no actual cash but plenty of time. If people can earn money by working for one another then they will bootstrap value through mutual exchange facilitated by a fair accounting/currency system. …In order to give everyone an equal opportunity to get involved and earn the currency people must be given an opportunity to work. The challenge is how to judge the relative quality and quantity of work that individuals provide and to do so in a way that efficiently allocates rewards to millions of users. This requires the introduction of a scalable voting process. In particular it requires that authority to allocate funds must be as distributed and decentralized as possible. This is the opposite view and approaches modern tech giants had had. Has this assumption proved correct? We can check that by looking at how successful the Steem cryptocurrency is as of the time of this writing. The Steem token is critical for the working of Steemit. How does it work? The fundamental unit of account on the Steem platform is STEEM, a crypto currency token. Steem operates on the basis of one-STEEM, one-vote. Under this model, individuals who have contributed the most to the platform, as measured by their account balance, have the most influence over how contributions are scored. Furthermore, Steem only allows members to vote with STEEM when it is committed to a vesting schedule. Under this model, members have a financial incentive to vote in a way that maximises the long term value of their STEEM. The STEEM is the cryptocurrency of the social media platform. In other words, this is the unit of exchange based on the blockchain that can be easily exchanged on the market. Of course, its value can change quite quickly. Thus, volatility for a cryptocurrency is normal. For instance, on January 1st, 2017 the STEEM was worth 17 cents. It closed on December 31st, 2017 at $3.01, you can see the historical data here. This is almost a twenty-fold increase! While cryptocurrencies are quite volatile, and this is a normal part of the growth process. The community needs a currency that allows it to bootstrap its growth by giving it enough incentives for a long-term growth plan. Stock options for startups are an effective tool to fuel their growth by giving ownership to employees; to create a strong incentive for growth. Fro the Steem community the equivalent of the stock options is the Steem Power currency. In fact, the users are rewarded for their activity on Steemit through Steem Power. This is a currency that follows a thirteen-week vesting schedule before. In short, those amounts cannot be easily traded on cryptocurrency exchanges. This token is quite powerful because it improves the influence of its holders on the platform. In short, the more SP you have, the more you can influence the reward system over the platform. This might be for a couple of reasons. First, the more you contribute to the platform the more SP you have. Second, by holding more Steem Power, you also keep more influence. In other words, you’re incentivized to keep it instead of vesting the token. Thus, contributing more to the long-term growth of the platform. There is also another critical aspect of the Steep Power. This gives as we will see the power to its holders to elect a group of people, called “witnesses” in charge of publishing price feeds. There is another aspect, which is critical for the growth of Steem. That is stability. That is where the Steem Dollars come handy. The Steem Dollars main aim is stability. In fact, the Steem dollars work as convertible notes. In fact, where startups use convertible notes as short-term debt instruments that allow startups to finance their operations by giving back ownership at a rate determined at the next funding round. The Steem Community leverages on Steem Dollars. A blockchain based token can be viewed as ownership in the community whereas a convertible note can be viewed as a debt denominated in any other commodity or currency. The terms of the convertible note allow the holder to convert to the backing token with a minimum notice at the fair market price of the token. Creating token-convertible-dollars enables blockchains to grow their network effect while maximizing the return for token holders. In short, the Steem Dollars is the equivalent of short-term debt and also the currency for which users that create quality content (intended as content that gets updates and shares) get – in part- paid for. SP holders elect individuals, called witnesses, to publish price feeds. The elected witnesses are presumably trusted by those who have a vested interest in the quality of the feed. By paying those who are elected, Steem creates market competition to earn the right to produce feeds. The more the feed producers are paid the more they have to lose by publishing false information. The primary concern of Steem feed producers is to maintain a stable one-to-one conversion between SBD and the U.S. Dollar (USD). Any time SBD is consistently trading above $1.00 USD interest payments must be stopped. The interests payments will be set up by looking aòsp at the debt to ownership ratio. In fact, this is a good metric to look at to assess the health of Steem over time. Thus, the feed producers assert an important control over the platform. However, they have also monetary incentives to avoid manipulating the feed price as they would get demoted. In other words, while dishonest witnesses might be able to distort the Price Feed in the short-term those should be wiped out in the long run. Since the SBD currency works as a sort of short-term debt. As for any startup or company, too much short-term debt might mean bankruptcy. For instance, as of the time of this writing, the SBD market cap is over $36 million, compared to a STEEM market cap of $793 million. This is is roughly a 4.5% debt to ownership ratio. The Steem Power (SP) currency can be converted in Steem (power down). If kept this gives its holder increasing voting power and influence over the platform. The Steem Dollars (SBD) give its holders an immediate and more stable currency that can be exchanged on the market. The economic effect of this is similar to a lottery where people overestimate their probability of getting votes and thus do more work than the expected value of their reward and thereby maximize the total amount of work performed in service of the community. The fact that everyone “wins something” plays on the same psychology that casinos use to keep people gambling. In other words, small rewards help reinforce the idea that it is possible to earn bigger rewards. Blockchain technologies have proved to be quite effective to manage decentralized systems. If as of now, companies like Facebook, Amazon, and Google have been able to leverage on centralized, opaque and asymmetric business models, this might have been justified by the lack of an alternative and effective way to organize those companies. However, those companies now have to face the entrance on the internet of decentralized startups that are willing to take the challenge. Would they attempt to scale up successfully, then the tech giants that conquered the internet in the last decade or two might have to revise their strategy if they don’t want to risk the extinction. As of now, the battle is still open. This battle is good because it opens up new possibilities. It also shows that there is an alternative business model to what we’ve seen taking over the web. As we’ve seen corporations are neither good or bad. In addition, also Steemit uses a reward system, like that of casinos that gives small payouts to the long-tail just to keep them coming back. Of course, we might argue this is used for good. Yet if we start asking what “good” means we get into a too complicated philosophical discussion. Instead, there are two critical aspects. Whether or not Steemit will succeed in the long term, that doesn’t really matter as soon as those tech giants that have dominated the market feel threatened and know they have to experiment with new business models if they want to survive. In addition, what is compelling about decentralized systems is the fact that by having them managed by a collective rather than a few, they are less prone to screw-ups. Last but not least, through the blockchain, it is possible to build up complex systems that still work effectively also if managed by a larger and larger number of individuals.